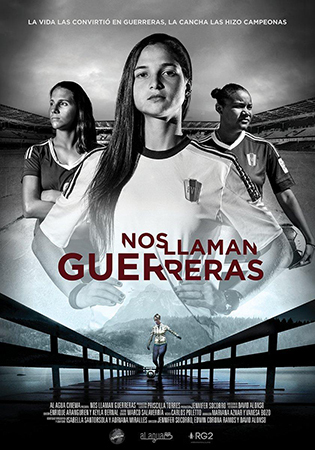 The documentary film Nos Llaman Guerreras (They Call Us Warriors) directed by Jennifer Socorro, Edwin Corona and the late David Alonso, centers on the Venezuelan women’s soccer team and their fight to win the first World Cup for their country. What makes these women different from all other female soccer players, they had to fight against their country’s political and economic strife to get there. Their coach explains that when he first started with these women, some were so poor that they could not afford toothpaste or deodorant, let alone have the funds to travel and compete with a soccer team. Against all odds, these women battle poverty and their livelihoods just to join the team. The film showcases the personal lives of many of these women, taking us deep into their rural communities and their homes. Yerliane Moreno’s town was so badly flooded that she thought she would never be able to leave her family to play soccer, but regardless she sacrificed everything to be on the team and play with all her heart. In this film, we also get to see how playing soccer enables them to be lifted out of poverty into having a better life. The star and key player of the team, Deyna Castellanos, got recruited to play at Florida State University and was given a full scholarship. We see Deyna leave Florida and come back to play at the World Cup with her team. Despite being gone for so long, she picks up the rhythm and plays to her best with her team as if no time has lapsed between them. When the women make it to the World Cup in Saudi Arabia, Jordan, they are faced with the best teams in the world. We see them fight and push through every adversity and in doing so, they become national heroes for their country. Their story was so inspirational that female soccer players in Venezuela increased by 97% after the World Cup, only further establishing them as role models to future generations of players. This film’s story was beautifully crafted and told, and by the end of the film, you cannot help, but become a fan of these women. Check out this and more at the San Diego Latino Film Festival until March 24.